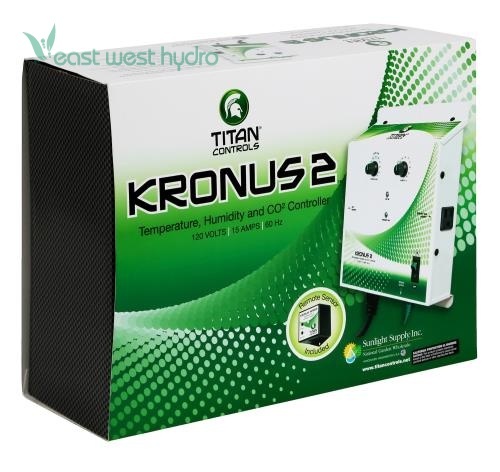 The Titan Controls Kronus 2 controls temperature, humidity and CO2 in your grow area at your preferred settings. The built in ten minute "CO2 Delay" deactivates the CO2 equipment if settings are exceeded using a digitally based system. The software polls temperature and humidity settings for ten minutes after the CO2 is defeated to verify that the conditions are too high, then activates your equipment to lower the conditions below your settings. If your conditions drop below the set point during the 10 minute "CO2 Delay", then the ventilation process is defeated and the "CO2 ON" outlet is reactivated, saving your valuable CO2 and keeping it amongst the plants. 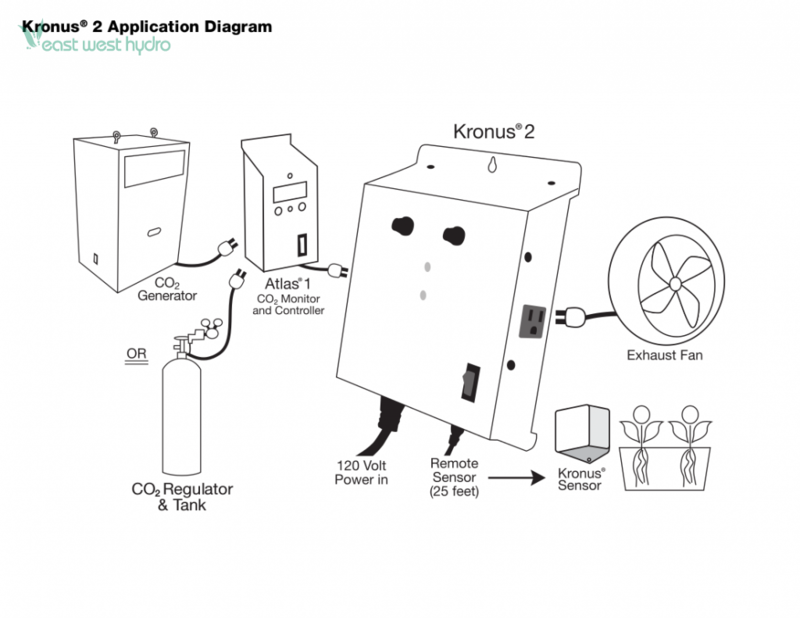 The "CO2 ON" feature is only activated during daylight periods to dose CO2 when your plants are able to uptake it, and is disabled during the nighttime hours or when the humidity or temperature exceeds the preferred settings. Controls temperature, humidity and CO2 in your garden. Activates "CO2 ON" outlet only during daylight hours. 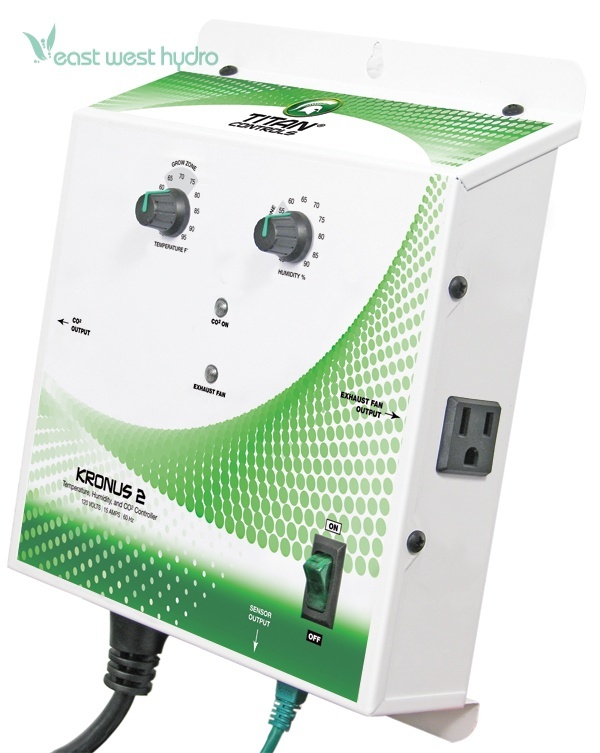 Ten (10) minute "CO2 delay" feature allows maximum CO2 coverage with minimum CO2 waste. Easy to understand and use with highlighted "Grow Zones". 25 foot modular remote temperature and humidity sensor. 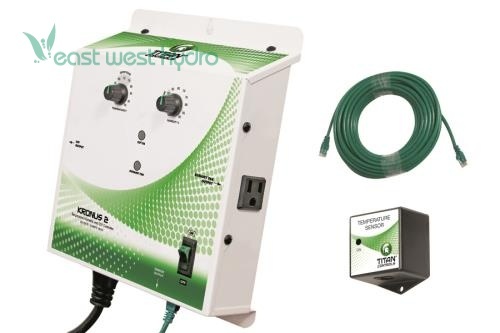 Improves your yield by creating the perfect environment for your plants. Dimensions: 14in. × 10.5in. × 5in.